Who Can Benefit From Mobile Aisle Shelving? Who says shelves need to stay in one place? If you have a lot of things to store and a limited amount of space to store it all in, you can get the most out of your storage space by investing in a mobile aisle shelving system. With mobile aisle shelving systems, there are many rows of shelves, but they don’t have a fixed aisle between each row of shelves. Instead, the shelves are set on tracks and can be pushed together to save space and easily moved apart to create an aisle when something needs to be accessed. By doing away with fixed aisles, you can significantly increase the amount of available storage space available in a room. The amount of space you can save depends on the configuration you use, but mobile aisle shelving solutions typically have a footprint approximately 50% smaller than a fixed aisle shelving arrangement. You might even be able to create enough additional storage space that you’ll be able to use your mobile aisle shelves to store things that were being stored in other areas, making it easier to find things. 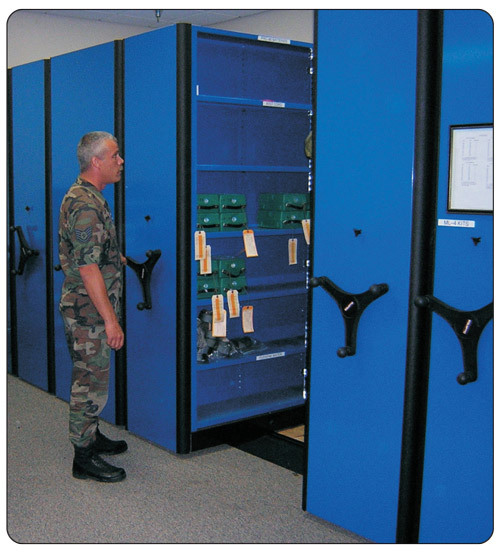 Mobile aisle shelving systems are excellent solutions for any business that needs to store a large amount of books, files, and other archive material, so they’re very popular with libraries, museums, banks, accounting companies, universities, healthcare facilities, and government agencies. They’re also great for organizing merchandise storage rooms in retail stores, keeping police evidence and property rooms in order, and storing extra parts in automotive and manufacturing facilities.